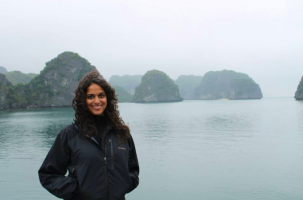 Julie Manoharan (Columbia College ‘09, SIPA ’18) returned to Columbia University to pursue her Master of Public Administration in Environmental Science and Policy (MPA-ESP) at Columbia’s School of International and Public Affairs (SIPA). Julie came to SIPA with significant experience in communications, program development, and education. She’s worked with a range of organizations, including the American Museum of Natural History, Simons Foundation, Project Syndicate and New York City Department of Parks and Recreation. MPA-ESP intern Shagorika Ghosh speaks with Julie Manoharan about strategic communication, sustainability and her time at SIPA. Tell me a little about your background. I’ve always been interested in human and environmental health, and tried to find organizations that engage with these issues throughout my career. Immediately after graduating from Columbia, where I majored in Sustainable Development, I worked with the NYC Department of Parks and Recreation’s GreenApple Corps initiative, which aimed to provide environmental education to Kindergarten through 8th graders in underserved communities and restore natural environments throughout New York City’s five boroughs. I also spent time as an educator at the Queens Botanical Garden, doing program development at Red Rabbit – a company that provides healthy, sustainable food in NYC schools – and as a freelance journalist focused on health and science. After cutting my teeth in education and journalism, I moved to the American Museum of National History’s Exhibitions department, where I was involved in the conceptualization and development of exhibits. A main focus during my time there was the renovation of the Theodore Roosevelt Memorial Hall, which centered on the creation of historical conservation narratives. From the museum, I moved to the Simons Foundation, where I worked in strategic communications and helped build their nation-wide SPARK program to engage 50,000 people with autism in a research community. SPARK was an incredibly gratifying project, especially since I saw it evolve from the ground up, but I wanted to scale up my expertise by pursuing a graduate degree. How does your communications work intersect with your interest in sustainability? The right communications strategy can convey complex science in a clear, distilled way. These strategies can help mission-based organizations educate people, who are otherwise unfamiliar with the science of, say, climate change, gain a nuanced understanding of the landscape. It’s that deeper understanding of the issues that can inspire and motivate people to take action. I want to help shape communications strategies for health and environment-focused organizations not only to garner this buy-in from people, but also to leverage support to develop impactful programs. What led you to be interested in the MPA-ESP program at SIPA? I loved working at the Simons Foundation, which leaned more toward basic sciences and developmental disorders, but I wanted to return to the world of sustainability and environmental health. It’s what I’m most passionate about, and it’s often overlooked as a major component of global human health. Coming to SIPA, I already had project management experience and had worked in strategic communications. But I wanted to get managerial training and policy expertise, both of which the MPA-ESP program offered. From the program, I was able to focus on the intersection of human and environmental health, while also honing my management and policy chops. What were some of your favorite classes and experience at SIPA? The summer semester is part of what makes ESP so unique. It’s incredibly intensive and science-heavy, and some of the quantitative elements were a real challenge. But it was an experience that I’m grateful for, and it went a long way in bringing our cohort together, because we were all going through it together. The connections I made within the cohort were one of the best parts about the program – it was an impressive cohort, and the way the program is set up, it encourages consistent collaboration with your classmates. We’re from diverse, interdisciplinary backgrounds, which allowed us to solve problems in unique and innovative ways. How do you plan to use the skills and tools you have developed after graduating? I’d like to take the expertise I gained during ESP, my program management and communications background, to inform the way large-scale health programs are designed and implemented. My time as a manager of the fall Workshop was particularly useful, as I looked for job opportunities leading teams and implementing advocacy campaigns. The guidance I got from my Advisor, Adrian Hill, was invaluable and since then I’ve relied on her for career advice throughout my job search and start of a new position. It’s one of the most valuable things I’ll take with me from SIPA. What were you hoping to gain from the MPA-ESP program, considering you entered graduate school already having about eight years of professional experience? At the ground level, I went to graduate school to earn a degree that would help me move forward in my career and transition into leadership roles. I wanted to pivot some of the content-area focus of my career away from more niche life sciences, and “zoom out” to address global health issues more holistically. The concentrated nature of the ESP program helped build out that expertise, since we were trained to use multiple tools – science, policy, and communication – to affect change. The other major value-adds from ESP were team management and client experience. Even though I came to SIPA with some years of experience, the Workshop course provided unique experience working for clients, and all this signals to potential employers that you’re capable of managing significant responsibilities and delivering high-quality products to prominent clients. What would your advice to prospective students of the MPA-ESP program be? I would tell them to engage as much as possible with the coursework, but also enjoy being in New York City. It’s easy to get overwhelmed with the amount of work you need to juggle during ESP, but it’s also important to explore this fantastic city – it is an amazing resource not only from a professional perspective, but also because of its endless cultural offerings. 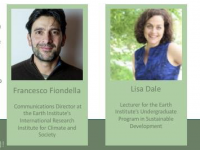 Students in the MPA in Environmental Science and Policy program enroll in a year-long, 54-credit program offered at Columbia University’s School of International and Public Affairs, in partnership with the Earth Institute. Since it began in 2002, the MPA in Environmental Science and Policy program has given students the hands-on experience and analytical and decision-making tools to implement effective environmental and sustainable management policies. The program’s some 800 alumni have advanced to jobs in domestic and international environmental policy, working in government, private and non-profit sectors. 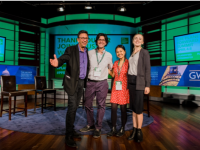 Their work involves issues of sustainability, resource use and global change, in fields focused on air, water, climate, energy efficiency, food, agriculture, transportation and waste management. They work as consultants, advisers, project managers, program directors, policy analysts, teachers, researchers and environmental scientists and engineers. Follow the Master of Public Administration in Environmental Science and Policy on social media: Facebook, Instagram, Twitter. Register here for upcoming information sessions and events or join our mailing list for updates.